Shortly after the Coronation of George VI in 1937, I left school and started work in the offices of Ronuk Ltd., a floor polish manufacturer based at Portslade. 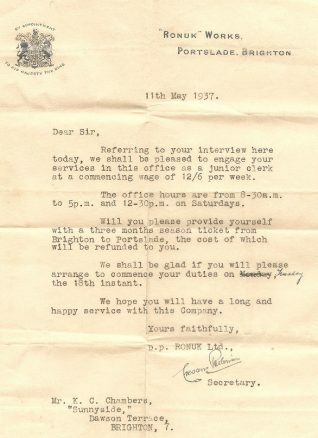 I had previously learned there was a job as an ‘office boy’ available there, so I had written to the firm, obtained an interview and was then advised I could start on 18th May. It was as simple as that, and I wrote to my school’s headmaster, explaining the position. It was only a week away from my fifteenth birthday and I was in my final year at school which would have ended in July. Office hours at Ronuk were from 8.30am to 5pm weekdays and 12.30pm on Saturdays. My salary was twelve shillings and sixpence a week. 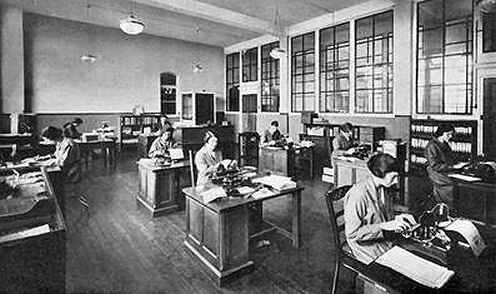 I worked in the ‘correspondence room’ where I looked after the mail, along with some filing and indexing. The room was very much like a classroom, with six shorthand typists sitting at two rows of desks. The manager was at the rear, and the mail, filing and indexing clerks along one side. In the office the ladies wore blue overalls which distinguished them from the factory girls who had white overalls and bonnets. If it had not been for the clatter of typewriters, coupled with the bell pinging at the end of each line and the noisy carriage being drawn back, our room would have seemed like a public library. There was no extraneous chit-chat; the only telephone in the room was contained in a kiosk so that its use would not detract others from their work. Eventually I was upgraded to a better position in the order room. I sat face to face with a girl and together we priced the incoming orders, mentally working out the calculations or referring to typed lists. We also had the job of counting the coupons sent in under the ‘Ronuk Reward Scheme’. I was altogether happier at the move, which still included relieving the gatekeeper in the time office, and taking the mail to Brighton sorting office. This extract from Brighton Diaries: Memories of a young man in peace and war 1929-1943 is published with permission from the author, Ken Chambers. The book is published by Hanover Books and available for sale on Amazon Books. Ronseal’s advertising slogan, “Does exactly as it says on the tin” became a national catchphrase for a product that started out at Ronuk Ltd. You can see it worked very well from the floor in the photo! I worked at Ronuk Polishes in Victoria Road Portslade, starting in possibly late 1961 or early 1962. I was an office junior in the buying office. The office used to be in what became Portslade town hall. The floors were of course perfectly polished! I remember most of my colleagues names from that time. Ízal Overseas Ltd also had offices there. The company was taken over by Newton Chambers of Sheffield and production moved to Sheffield. I was told a certain Mr Kenneth Horne (a radio tv personality) who was a “friend” of the MD Mr Morris had something to do with the takeover, but this is heresay. Mr Webb was sales director. Mr Cottingham was the postman. Mr Ford, a gent named Brian was in the accounts office and Robin Ford and Richard were also there, as was Mrs Hull and Rita in the buying office. The late John Leigh was in FSD (floor service dept) taking over from Mr Trevor Standing. Mr Honan and Mr Roper were in the Izal office with Patsy and Vicky. I remember I liked to experiment making polishes in the lab at lunchtimes.